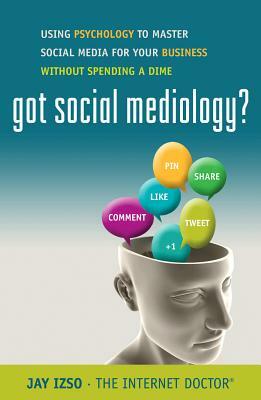 With a witty style and no-nonsense attitude, Got Social Mediology? dispels the myths, gives the real scoop, and provides business- people everywhere with all they need to cus- tomize a social media marketing plan that's right for them. The book's approach is simple but revolution- ary: by understanding the psychology of the social media user and focusing on creating au- thentic relationships rather than engaging in paid-for advertising, you will be able to grow your business on social media, far faster than ever before and without emptying your mar- keting budget in the process. That's good news for business owners everywhere. JAY IZSO, the Internet Doctor, is a psychological business consultant, social mediologist, speaker, and writer who helps entrepreneurs and small businesses reduce their marketing budget and achieve higher ROI by understanding the psychology of their consumer on social media and beyond. He has a Master's of Science in Experimen- tal Psychology from Washington State Uni- versity and has taught psychology for more than twenty years, including at Washington State University and North Carolina State University. When he's not busy consulting, engaging on social media, writing, teaching, or speaking, Jay enjoys life as a wine geek, musician, sports fan, and movie buff. He lives in Raleigh, North Carolina, with his wife, Linda Craft, and their two dogs, Katie and Bandit.